Unless you regularly visit your local farmers market, it can be difficult to know which fruits and vegetables are in season. Most grocery stores carry the majority of popular produce items year-round, whether or not they are in season. There are some big benefits to eating fruits and vegetables that are in season. When you choose in-season produce, you’re more likely to get fresh, locally grown foods. In-season produce is also both more flavorful and more nutritious. If harvested during peak season, fruits and vegetables have had plenty of time to mature and develop nutrients. When picked too early, produce has to ripen in transit to the grocery store or even at home on your countertop. While that produce may taste fine, it usually lacks the nutrients it would have contained had it been left to ripen on the vine or tree. For example, in-season spinach contains up to three times more vitamin C than spinach grown out of season. So what foods should you be eating right now? Here’s a guide nine fruits and vegetables that are in season during the summer. Garlic: Garlic is a great source of potassium, iron, calcium, magnesium, zinc and vitamins B and C. Known to be a disease-fighting food, garlic can add delicious flavor to any dish. Try this creamy garlic pasta with shrimp and vegetables for a light and satisfying summer meal. Peas: Peas contain folic acid and vitamins K and D. Look for plump, green pea pods with fresh looking skin. This simple recipe for lemony snap peas makes a tasty side dish to any dinner. Peaches: A sweet and satisfying summer treat, peaches are a good source of antioxidants and minerals including potassium, fluoride and iron. Choose peaches that have tight skin and are firm, but which give slightly when gently squeezed. Make your own fro-yo with this recipe for five-ingredient peach frozen yogurt. Tomatoes: No matter the variety, summer is the season for fresh tomatoes. All tomatoes are a good source of vitamin C and contain the antioxidant lycopene. Like peaches, look for tomatoes that are firm, but which give a little to slight pressure. Be sure the skin is intact and the tops are not hard, yellow or split. This light and fresh gazpacho salsa recipe makes the perfect appetizer for your summer gathering. Melons: There’s a wide variety of melons to choose from in the summer, including watermelon, cantaloupe, muskmelon and honeydew. Melons are a great source of minerals like potassium and manganese, the antioxidant lycopene and vitamins A, C and B-6. Chill out on a hot summer day with a spinach-honeydew cooler. Radishes: This often-overlooked root vegetable is a great source of vitamin C and disease-fighting antioxidants. Choose radishes that are firm with their green tops still intact. Put a twist on taco night with this recipe for chipotle chicken tacos with radish salad. 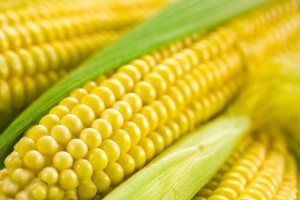 Corn: The perfect addition to your cookout, corn is rich in potassium, magnesium, iron and vitamin B. It is healthiest when eaten the day it is picked, before its sugars turn to starches. For that reason, the best corn is purchased from local farmers. You can even find roadside stands selling corn picked that day. You can’t go wrong with Bobby Flay’s recipe for perfectly grilled corn on the cob. Broccoli: Along with its cruciferous cousins rabe and rapini, broccoli is a nutrient-dense veggie containing vitamins A and C along with several minerals. Try this yummy Greek salad with shaved broccoli and peppers. Cucumbers: Cool off and stay hydrated with water-packed cucumbers, which are a rich source of potassium and vitamin K. Need something light for lunch? Try this recipe for healthy cucumber, tomato and avocado salad.